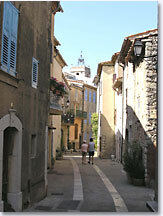 Leaving Fayence, take a narrow winding road (D563) and you will discover Mons. 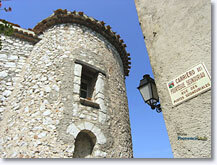 At an altitude of 800 m, it's one of the highest villages in the Var. As you emerge from an oak and pine forest, Mons suddenly offers itself to your admiring gaze. Built on a high plateau, in an area occupied since prehistoric times where the Romans built an aqueduct (still visible at Rochetaillée), Mons once belonged to the principality of Callian in the 11th century, before becoming a stronghold of the Villeneuve family up until the Revolution. This beautiful little Provençal village still stands proudly on a rocky spur, where the remains of the feudal castle and its defensive wall can still be seen (at the least the base of one tower). Far from crowds, noise and pollution, it is a peaceful haven of pure air, where it is wonderful to wander along picturesque alleys and admire the solid ancient stone-built houses, some of which still incorporate medieval remains. 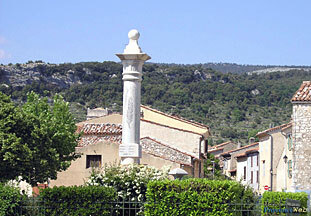 The entire village is smart, well-kept and restored to a great extent, as shown by the number of inhabitants which has been increasing ever since the sixties. In summer, the terraces in Place Saint Sébastien cooled by beautiful fountains, become animated. This vast square captivates the visitor with its panoramic view. An orientation table enables you to explore the landscape, from Cannes and Mount Faron, to the islands of Lérins and the Estérel, as far as Saint Tropez and even Corsica on a particularly fine day. 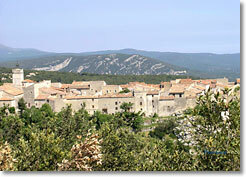 The highest summit in the Var is located in this municipality, Mont Lachens reaching 1715 m at its peak. So if you like hiking in Provence, take note ! - Notre-Dame church, 13th-17th century (altarpieces listed in the inventory of historical monuments and two processional crosses, also listed). - Chapel of Saint-Sébastien des Pénitents Blancs (17th century), part of which houses the mayor's office: Penitents triptych and furniture. - The Marine et montagne museum (scale models of ships made by an artist from Mons, Robert Audibert). - In the surrounding area: The gorges of the Siagne and the Siagnole Rochetaillée, dolmens, hill fort, Beauregard castle. Fishing (trout rivers) water sports at Saint Cassien Lake. Micro-light centre (20 km). Hang-gliding at Lachens (25 km away). 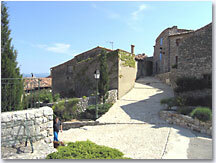 Tourrettes (12 km), Fayence (14km).